Errol: If you have ever wondered what a female, more successful and charming Errol would be like, it would be Debbie Ohi. She’s a writer, an illustrator, a musician, a filker, a boardgamer, and a social network guru. I trust her implicitly with anything online and she has given me oodles of advice and wisdom. We have done a few collaborative works together (The Nanotoons for Nanowrimo) and I cover one of her songs on the upcoming Debs&Errol CD. 😀 In fact, it was her idea to do a Google Plus Hangout concert! So I had to do a comic about her! I didn’t have time to make her look more enthusiastic, unfortunately. The comic doesn’t do her justice. 😀 Next time I will. Next time. 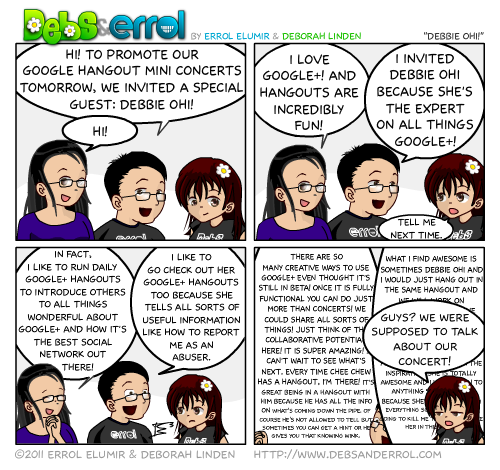 Oh wait, I was supposed to talk about our Google Hangout Concert this saturday. That’s in the post below and in the side bar. Another person on your comic that’s not me…. how many times did I beg??? Yes, and even THAT is covered by a speech bubble. Blubber and weep. I’m unloved. Actually, it’s covered by Debs. You can blame her. 2. She wasn’t in a doctor’s coat.